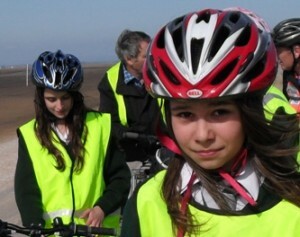 Cycling England’s high media profile helps to encourage individuals, families and communities back into the saddle. We frequently contribute to breaking news and cycling features, offering spokespeople, case studies, research and opinion. Our media campaigns are energetic and evidence-driven, using creative ways to engage the public and policy-makers with cycling. We tackle topics head-on, and our experts are leading national conversations on issues like safety, participation, obesity and training. Click below to access the latest news and comment, as well as recent reports and factsheets. For further information, journalists should contact the Cycling Office Press Office on 020 7260 2782. What is your job or other main activity that involves cycling? I work as a Paramedic for Yorkshire Ambulance Service NHS Trust in Sheffield where I set up and developed the Cycle Response Unit in the city to show that a hilly area is no obstacle. “Tri cycling” is a three day course including Bikeability, mountain biking and BMX, aimed mainly at children aged 9-12 (a Cycle Shrewsbury target group) who have not had BMX or MTB coaching before. Trainees have to sign up to do all three kinds of cycling - they can’t just pick their favourite. A group of girls aged 12-14 from Greenbank High School in Southport spent three months producing a film called ‘Pedal Power – The Way Forward’, it shows how they have explored cycling and the role it can play in local people’s lives. The film was premièred at a special event at Southport Arts Centre. I am the Programme Manager of Cycle Cambridge, an initiative delivered by Cambridgeshire County Council that is getting more people cycling, more safely, more often. How long have you done that?